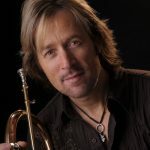 Jazz musician, David Wells will be having a CD Release dinner and concert on September 19th at the Hilton Hotel in Columbus for his new album, Midnight Cruise. The night will include a “First Class” dinner, concert and a free “Midnight Cruise” CD. Playing with David that evening will be local jazz musicians Scott Gold on bass and Shane Willis on drums. David Wells is a full time “Musician & Motivational Speaker and spends most of his time in Ohio and the Columbus area. For three years he has been performing in the state of Ohio conducting “High School, Middle School and Elementary School Assemblies.” Most of the assemblies consist of a Mini-Concert, and a Motivational message emphasizing themes that you would like to have reinforced in your school, ie. Reaching your Goals, The Power of a Dream, Importance of Discipline and Focus, etc. In March 22nd 2010 he was nominated for “American Smooth Jazz Award. David has released 9 CD’s, David Wells CD’s can be purchased in “Border’s,” “Barnes & Nobles” and “Best Buy” stores.